Last night was our monthly Chocoholic Chicks meeting and for the project we made a Fall Sampler. The ladies all loved theirs, so I got to thinking, what if I offered this as a class? Since I already have all of the supplies out (just need to cut the cardstock and DSP), I thought about offering this as a class this Monday, October 20, at 6:30 PM. I know it's late notice, but if you'd like to make one and could come to class, let me know. Cost is $15 without a frame. It will fit into an 8x8" square shadowbox frame or could be made to fit in a 9x9" shadowbox frame. Oh, you want to SEE it first? Okay. It was CASEd from one I saw somewhere, but I can't locate the stamper's name who made the original. 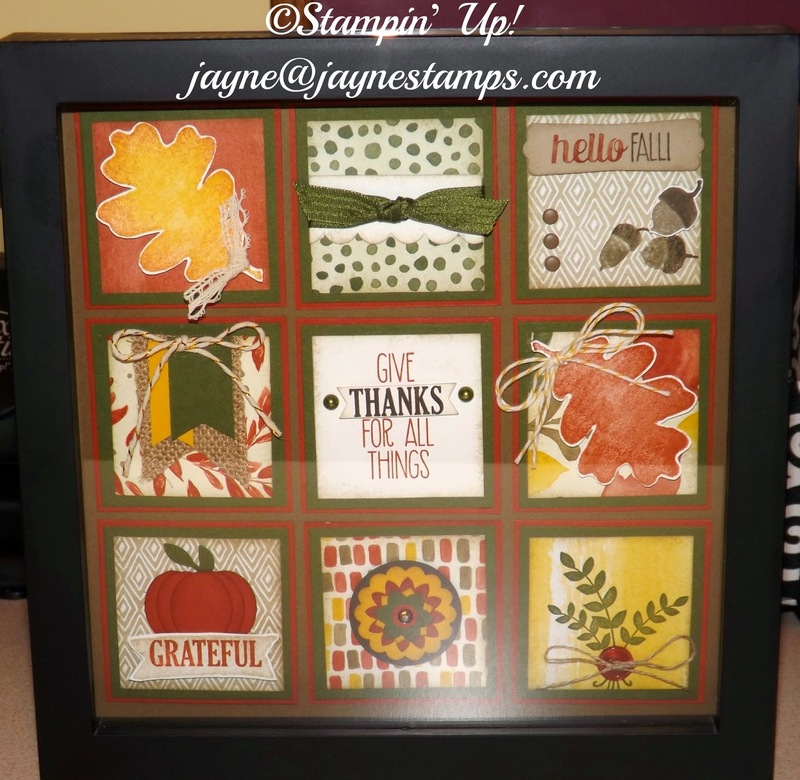 If you want to come, please bring your regular stamping supplies along with a strong adhesive (like Sticky Strip) and if you have it, a Crumb Cake ink pad (since all of the squares are sponged along the edges with Crumb Cake, you can finish up faster if you have your own pad). If you don't have a Crumb Cake pad, it's not a problem; I have two that can be shared. Please let me know no later than 1:00 PM on Monday if you want to come to class to make one of these. That should give me enough time to get all of the supplies cut and prepared. You can send me an e-mail or contact me through my Facebook page.